BMW will offer 700 electric cars for lease in U.S. The ActiveE is BMW's second electric car trial and a prelude to its first all-electric car, the i3, which is due in 2013. NEW YORK -- BMW of North America will lease 700 ActiveE electric cars to U.S. customers starting later this year and has expanded the model's 24-month trial to new markets. The ActiveE, which is based on the 1-series compact coupe, will be leased in New Jersey, New York, Connecticut, Boston and three California cities. Lessees will be charged $499 a month after a $2,250 down payment, the automaker said. The ActiveE is BMW's second electric car trial and a prelude to its first all-electric car, the i3, which is due in 2013 and designed for major cities. The four-seat ActiveE will use the same lithium ion batteries that will be used in the i3. The battery pack is expected to produce a range of 100 miles. 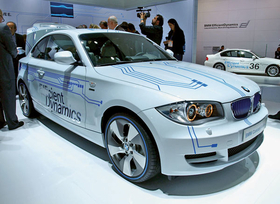 Rich Steinberg, manager of electric vehicle operations for BMW in North America, said BMW also is offering a new application for Apple and Android devices called BMW Evolve that will help drivers decide whether they want to lease the ActiveE. To give the ActiveE a true 100-mile range, the ActiveE batteries will cool or heat while still plugged in and charging, Steinberg said. The ActiveE has a 170-hp electric engine and can go from 0 to 60 mph in under 9 seconds. BMW's first trial of an electric vehicle featured 450 electric Minis in New Jersey, New York and Los Angeles. Separately, BMW said it will offer its first four-cylinder engine in the U.S. market after more than a decade in the Z4 sDrive28i roadster available this fall. The 2.0-liter four-cylinder turbocharged engine has 240 hp and 260 pounds-feet of torque. BMW said it is similar in power but offers more torque than the normally aspirated 3.0-liter inline six-cylinder. BMW executives said the engine will be offered in other vehicles but declined to give details. It will likely be in the new-generation 3 series due in 2012.